Buffet Restaurant "La Table" at Ibis Ambassador Seoul features a special "Rib Eye Grill" to its buffet through Nov. 30, 2007. The buffet, available at 21,500won for lunch and 25,000won for dinner, meets your budget for fine dining at an urban hotel with a fine array of dishes, especially rib eye grill through November 30. 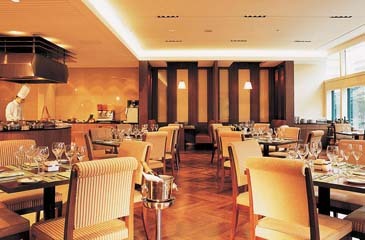 Featured dishes include salad corner, chef's recommended hot dish, assorted sushi and rolls, fruits, coffee and desserts. Also, do not forget to try rib eye grill made of premium steak. Unlimited red wine and draft beer are also included. Book your table at La Table for your year-end gatherings. For the budget, La Table offers enough of romance with red wine and fine dining.